Reckless driving is the “catch basin” for many driving-related crimes that are difficult to prove, have significant mitigating circumstances, or are too expensive for the prosecution to prove at trial, similar to a disturbing the peace charge (Penal Code § 415) for minor, non-driving offenses usually charged as misdemeanors. Summary in 65 Words or Less: Reckless driving is defined as driving a motor vehicle on a public highway in wanton and willful disregard for the safety of others. A conviction for this can have a more adverse effect on one’s immigration status than a DUI, so it is important to consult with an immigration attorney before entering into such a plea if one is not a U.S. citizen. Reckless driving itself is defined as driving “a vehicle upon a highway in willful or wanton disregard for the safety of persons or property…” Under subsection (b) of California Vehicle Code § 23103, this crime can be committed also in an off-street parking facility. The minimum punishment is five days in county jail, but this can be suspended (not imposed) and commonly is The maximum is ninety days in county jail. The minimum fine is $145 and the maximum fine is $1,000. The statute allows a judge to impose both the jail time and a fine in appropriate cases. A “wet reckless” is better than a DUI for one big reason. With a “wet reckless” conviction or plea, the court does not notify the DMV that there was a conviction for DUI (because there was not). This means the DMV will not then require the driver to install an ignition interlock device (IID) as a condition to receiving a restricted license. Not only is an IID somewhat expensive, but the devices often malfunction and can prove embarrassing if one has passengers. A “dry reckless” is far superior to a “wet reckless.” However, a “dry reckless” is much more difficult to negotiate than a “wet” reckless. A “dry,” as compared to a “wet,” does not count as a prior DUI in a further DUI prosecution. In other words, if one pleads to a “wet reckless” in 2012, but is then arrested for DUI in 2015 and prosecuted for DUI, the 2015 DUI will carry with it sentencing enhancements as a second DUI based on the 2012 plea bargain. If the 2012 plea had been to a “dry,” the 2015 DUI would be prosecuted as a first-time DUI. Both a “dry” and a “wet” reckless are far superior to a DUI if there is a probation violation. If one pleaded to a reckless driving, the maximum jail time a court can impose for a probation violation is ninety days, whereas with a probation violation for DUI, the six months is the maximum jail term. Probation is also usually shorter for a plea to reckless driving, usually one or two years. However, when the reckless driving charge is negotiated from a DUI, it is not uncommon for probation to last three years. The fines for reckless driving are also quite a bit lower. If the court imposes the $145 fine, the total payment to the court after penalties and assessments are added, may only be about $640. In a DUI, in contrast, the minimum fine is $390, which leads to a total payment of roughly $1,860 once penalties and assessments are added, but before any credit is applied for time-served, i.e. at booking (usually one or two days). If one is lucky enough to win a “set aside” of one’s driver license suspension at the DMV hearing, a dry reckless has no mandatory alcohol awareness class as part of its minimum sentence. With a DUI, minimum punishment includes a three-month minimum DUI class (the AB541 class). 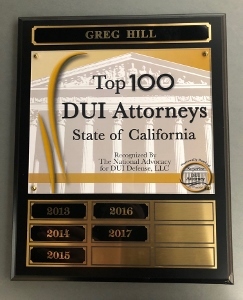 Consequently, when one is lucky enough to win a “set aside” and a wet or dry reckless, the driver can avoid the time and fees associated with a DUI class.